Raising My Little Superheroes : The wrong plate! 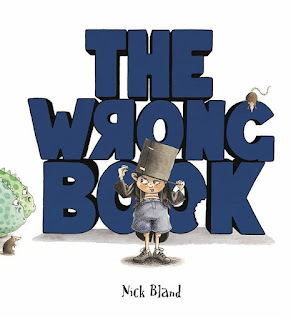 Ever heard of a children’s book called “the wrong book” by Nick Bland? My kids love this book, in fact they love all of Nick Bland's books. “The Wrong Book” is a very repetitive book, which L loves. The jist of the book is that Nicholas Ickle (the main character and narrator) is trying to tell his story and keeps being interrupted by other characters. His catch phrase is “you’re in the wrong book!” I can recite this book in my sleep, that’s how often we read it! L and O are very specific about which plates they’ll use, which cutlery they want, which chair to use, which place mats, which spot that they’ll sit in. I won’t go on, but you get the idea. Me: Which plate do you want? Well that narrows it down then, could it be one of the oval plates, the round ones. Someone help me please, what other plastic plates do we have? L: The one with no picture. Okay then, that makes it easy, an oval plate as I get a blue plate out. L: That’s the wrong colour! M: Which colour would you like? M: This is the blue one. Mumbling to self as I look at the clock while going to get the light blue plate from the cupboard. L: Mmmmm, maybe I changeded my mind. I needs green one now. Oh help, crumbs, think on your feet. M: The green one is in the sink buddy, remember, you used it last night for your green apple before you went to bed. L: But I needs the green plate, please? He said please, I can’t not go and wash it when he’s used his manners. Give it a quick wash.
M: Here you go little man. L: Not that one! That’s the wrong one! M: What do you mean it’s the wrong one? This is the green plate. L: No, the bread, it the wrong one! Oh dear, it’s going to be a long day………..